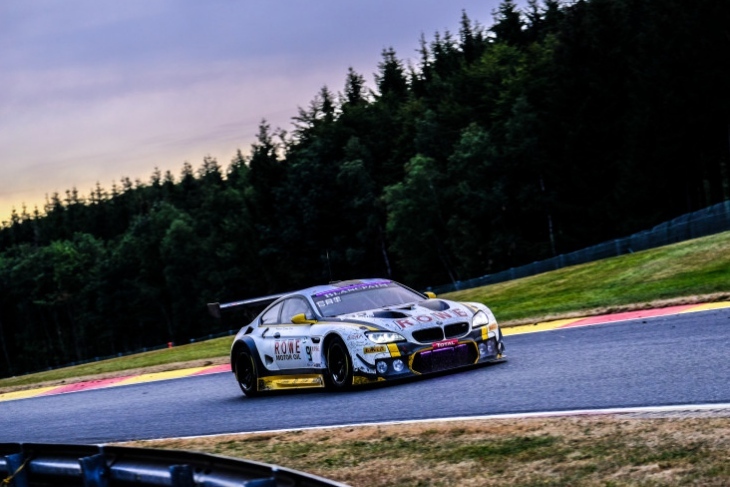 This year’s Total 24 Hours of Spa was a hard fought battle that swung one way, then another right down to the final hours, the 70th running of the endurance classic severely affected by caution periods that dominated the race. Helped by the problems of their rivals, the BMW M6 GT3’s of Walkenhorst Motorsport and Rowe Racing steadily worked their way to the top of the order as first the Audi, then Aston Martin, Ferrari, Porsche and Bentley entries found trouble. 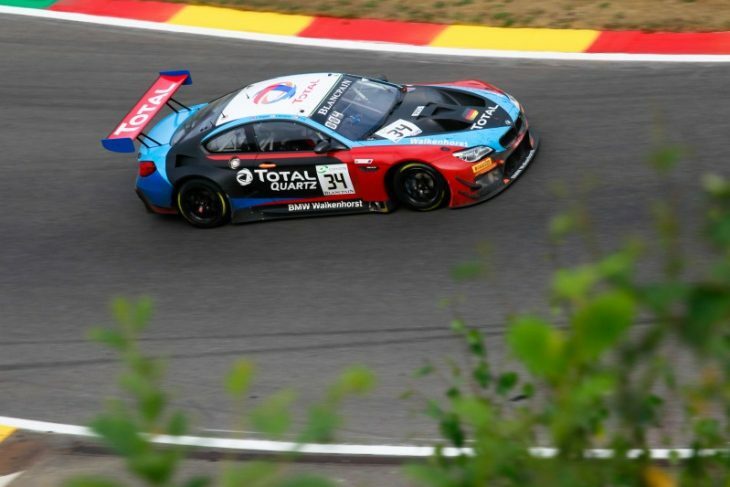 But it was the #34 Walkenhorst Motorsport entry driven by Phillip Eng, Tom Blomqvist and Christian Krognes that took the team’s first win in the event, in its first entry in the Pro category. Though the #4 Black Falcon Mercedes AMG GT3 of Yelmer Buurman, Luca Stolz and Maro Engel featured and applied consistent pressure throughout the race, it was the two BMW’s that took control of the situation in the final quarter, which was really the only time during which the race settled and became anything resembling manageable and predictable for observers. Behind the winners, the sole-remaining ROWE Racing BMW (the #99) of Alex Sims, Jens Klingmann and Nicky Catsburg took second. Sims was installed for the final stint and pushed hard to catch Eng, but couldn’t get close enough to make a move, and instead crossed the line 10 seconds behind the winning car, securing BMW a 1-2 for its record 23rd overall win at the event. “Very pleased to be back on the podium, having won it two years ago. Shame it wasn’t the win, but it’s still a great result for BMW,” Sims said after the race. 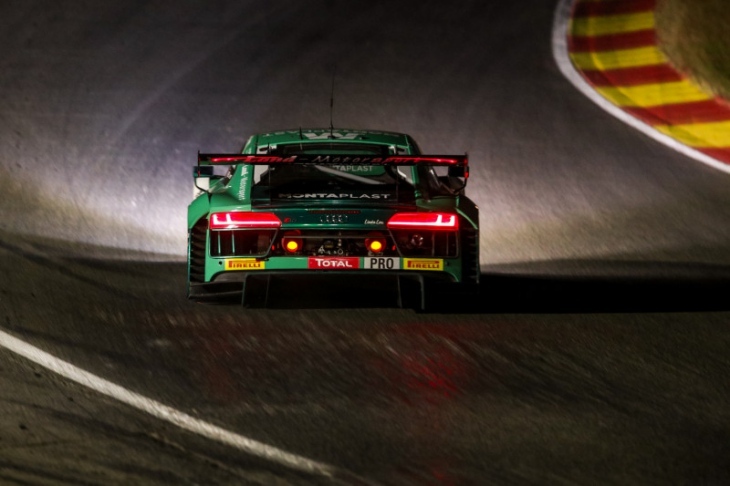 The #29 Land Motorsport Audi ended up third, a further 27 seconds down the road, the German team’s R8 LMS losing crucial time due to penalties, which by the end, effectively cost the team a win. The #25 Audi of 2017-winner Sainteloc ended up just off the podium in fourth, ahead of the #4 Black Falcon Mercedes which completed the top five. Despite there still being a handful of contenders on the lead lap all the way to the end, throughout the race there were plenty of dramas for key teams in the Pro class. Rene Rast’s #2 WRT Audi R8 GT3 led away from Maxime Martin’s pole-sitting #62 R-Motorsport Aston Martin, the sister WRT Audi starting from the back of the Pro field for a qualifying infringement. 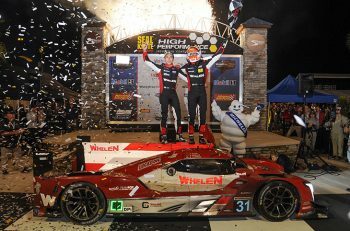 And, it must be noted that while Sainteloc and Land ensured that Audi had a chance of winning all the way to the flag, WRT had a forgettable race. The #1 which had to serve a three-minute stop go penalty following its Super Pole exclusion ran well, but nevertheless was unable to contend, eventually retiring with technical issues in the last hour. Then there was the #17 and #2. 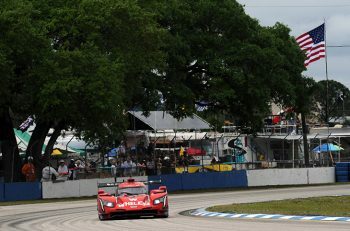 The former was delayed after losing a wheel in the opening hours, and the #2 after leading in the opening stint of the race gradually faded away. The leading Porsche entries of seasoned campaigners Manthey Racing, joined here by the KUS Team75 Bernhard entry, had pace but also had problems. The #117 Bernhard car punched hardest, but was only able to fight in the bottom end of the top ten before being taken out in an accident involving the #8 Bentley and Aust Audi on Sunday morning, suffering severe damage which forced it into the garage. The #911 Manthey 911 GT3 R ran well in the first half of the race, but suffered an alternator issue. It just wasn’t the Stuttgart marque’s weekend. 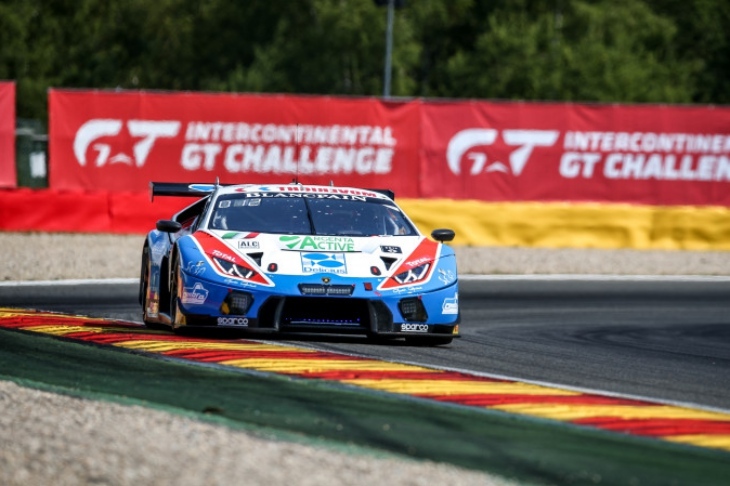 Ferrari’s best hope in the shape of the SMP Racing 488 GT3 faded overnight in a succession of excursions through tyre issues, while the M-Sport Bentleys showed well but picked up mechanical and accident damage on Sunday morning in a competitive but challenging outing. 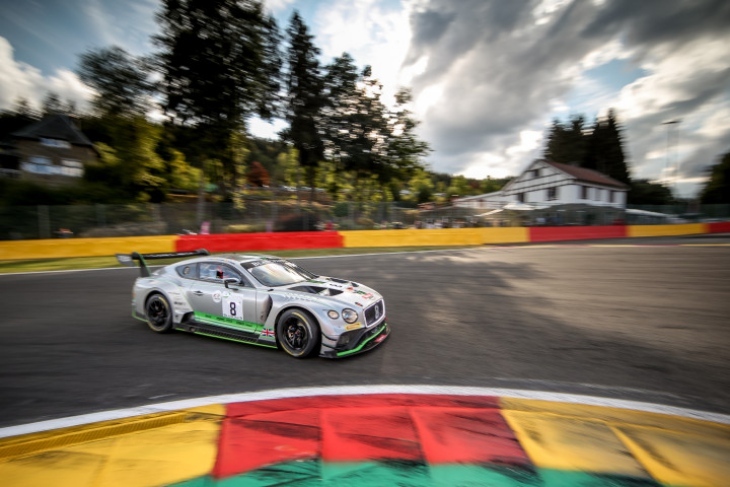 For M-Sport Bentley, the team will feel this was another missed opportunity to win at Spa. Its 2018 Continental GT3s had front-running pace, and early on, led comfortably with the #8. But it would all unravel for the team as the race wore on, the #8 suffering a steering issue after contact, and later a big incident on the run up to Blanchimont with the Bernhard Porsche and Aust Audi which forced the team back into the garage for further repairs. The #7 meanwhile, was a contender until the final quarter of the race, when it suffered a holed radiator from debris and damage to the right-rear corner, which dropped it out of contention with five hours to go. For R-Motorsport, like Bentley, the team had the potential for a big result, but poor luck, in the end, left the Swiss team with a bitter-sweet outcome. The #62 led the race early, battling with the #2 WRT Audi, but lost over a minute due to a fuel rig issue, and due to further troubles with brakes, punctures and contact with an Am Lamborghini during the night, never recovered. The #76 meanwhile, stormed through the field from the back of the grid in the opening hour with Nicki Thiim at the wheel and ran in the top five in the first half of the race. But an extra brake change, and punctures, also meant that it would fall off the lead lap. 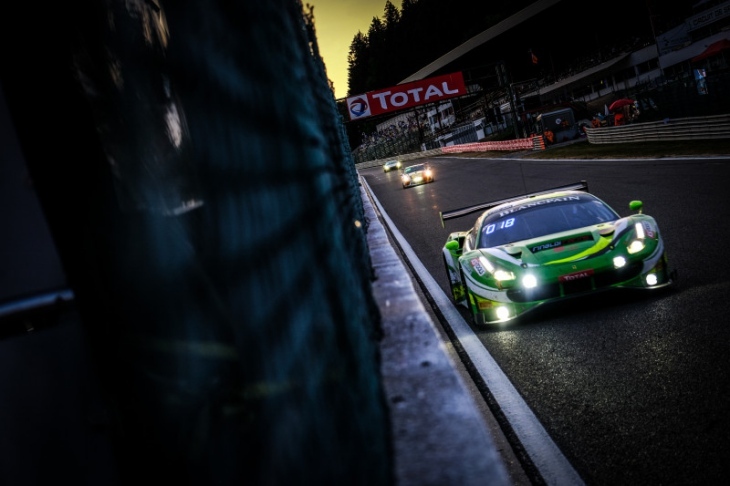 Nevertheless, R-Motorsport team principal Dr Florian Kamelger was still pleased with a top 10 for the team in its first Spa 24 Hours. “This was the first time with the team in Spa, it’s been a huge team effort getting both cars to the finish,” he said. “It was an unbelievably hard race, but finishing P9 with a car that started last on the grid was unbelievable. We are happy to have done that and we are happy to have raced here. The ‘Old Girls’ still have life; they still have the pace and we proved that. But while the weather didn’t provide the quite the difficulty predicted the race was very much dictated by a relentless succession of safety periods as the challenge of Spa Francorchamps proved this circuit is never to be treated without respect. Stephane Ortelli’s fiery accident at Eau Rouge in the #114 Emil Frey Lexus allowed him to walk away, but the #666 Attempto Racing’s accident involving the #31 Team Parker Racing Bentley at the same legendary corner left two drivers in hospital, halting the race for two hours during the night. As dawn broke on Sunday the race finally seemed to settle down, the winning #34 BMW holding station over Rowe Racing’s #99 M6 GT3 in the hands of Alexander Sims, Jens Klingmann and Nicky Catsburg. These slugged it out at the front, chased by the Audi of Markus Winkelhock, Frederic Vervisch and Christopher Haase in the #25 Sainteloc entry. But a last pit stop misjudgement by the #25 crew meant the #29 Monteplast by Land-Motorsport R8 LMS that Kelvin Van der Linde, Sheldon Van der Linde and Jeffrey Schmidt had pedalled hard all week took the final podium position, the team deserving the third place having rolled with everything that was thrown at them. 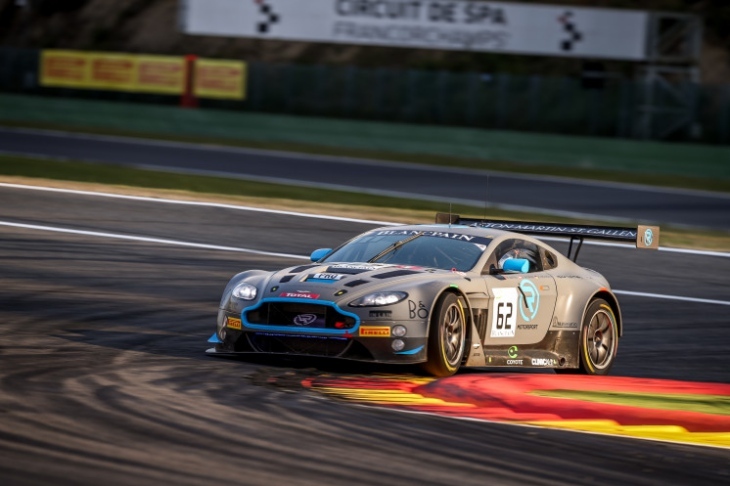 While the Pro class was close, and entertaining throughout the Spa 24 Hours this year, the other categories in the race were far more quiet affairs, with very memorable few on-track battles for podium-paying positions once the race settled down. That was until, the final hour when the Silver Cup lead battle hotted up. In Pro-Am, it was the #333 Rinaldi Racing Ferrari 488 GT3 of Daniel Keilwitz, Alex Mattschull, Rinat Salikhov and David Perel that took the win. While the class saw multiple lead changes during the first half of the race, it turned into a dominant run for the German team, its Ferrari crossing the line a lap clear of the competition. Completing the podium, was the #42 Strakka Racing Mercedes, which led the class for a long period when night fell on Saturday, but eventually faded to second by Sunday morning, where it would finish. The #175 SunEnergy 1 HTP Mercedes completed the podium, after running in the top five for almost the entire race, a couple of mistakes costing the team a better result this time. The Silver Cup, on the other hand, saw a close fight for the class lead through the second half of the race. And after 24 hours it was Ombra Racing that took the checkered flag first, its #12 Huracan of Alex Frassinetti, Romain Monti, Andrea Rizzoli and Kang Ling enjoying a near-faultless run. 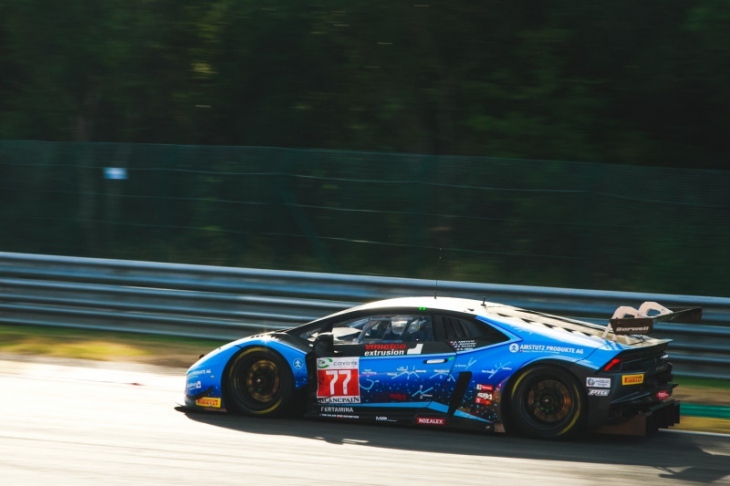 Behind, the #78 Barwell Motorsport Lamborghini finished just two seconds behind, after Kodric was involved in a nose-to-tail duel for the win with Frassinetti in the final half hour. But he couldn’t quite get past through traffic and take the win. Rik Breukers, Sandy Mitchell, Martin Kodric and Michele Beretta came close, but not close enough. It was a well deserved second place finish though for the British team though, and a comfortable one too, as the #6 Black Falcon Mercedes ended up two laps down in third, denying the #54 Emil Frey Jaguar crew which led early from taking silverware home. Barwell missed out on a Pro-Am win, but it did triumph in Am, the #77 Huracan of Adrian Amstutz, Leo Matchitski, Richard Abra and Patrick Kujala dominated the class on Sunday, finishing an impressive 28th overall, and five laps ahead of the #9 Target Racing Ferrari which came home second, and the #488 Rinaldi Ferrari that completed the podium. The depleted two-car Group N class was won by GDL Racing’s Huracan Super Trofeo.